See what tools the NewWoodworker.com viewers liked best this year! The 2010 Top Ten Tools list once again shows that interest remains strong among NewWoodworker.com viewers in quality tools that have a distinguishable impact on their woodworking. Price is always important but the lopsided interest in higher quality tools shows that value for the tool dollars spent remains the primary criteria for most NewWoodworker.com viewers. The Top Ten Tools of 2010 were ranked by the number of page views that review has experienced along with the number and tone of the emails received on that tool. Contrary to the “I know all” espousing of some forum “experts” the manufacturers involved do not pay for or bid on slots in the Top Ten Tools list. The viewers of NewWoodworker.com make all of the choices, as it should be. I cannot recall any tool that enjoyed the level of pent up interest that the Bosch 12" Dual-Bevel Glide Miter Saw elicited from the NewWoodworker.com viewership. Bosch tools always do well in traffic on NewWoodworker.com but I had over 200 emails seeking information on the Bosch 12" Dual-Bevel Glide Miter Saw before it ever got to my shop! Despite arriving just weeks before this years Top Ten Tools was compiled the Bosch 12" Dual-Bevel Glide Miter Saw shot right to the top! JET products also do well consistently with NewWoodworker.com viewers because of their usefulness in the shop and pricing. The JET JWBS-14DXPRO Band Saw appears to have been designed around the “wants” of most woodworkers after they buy a band saw. Naturally the riser block heads most woodworkers aftermarket lists so JET lengthened the cast iron frame to “build in” the riser block. In addition to getting the extra resaw capacity right out of the box this change also eliminates the hassle of taking a brand new saw apart to install the riser block. The JET band saws were always a favorite of NewWoodworker.com viewers but the new configuration pushed those numbers even higher. Factor in a price that did not rise too much and the reasons to like this saw are even more impressive. Click Here to see the full review of the JET JWBS-14DXPRO Band Saw. Milwaukee has always made tools that are popular with woodworkers and contractors. 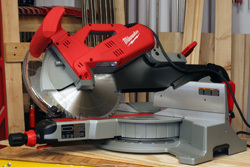 Their Milwaukee 12" Dual-Bevel Sliding Compound Miter Saw drew a very quick response from NewWoodworker.com viewers who liked the features, capacity and durability of this saw. Milwaukee tools have a reputation for being very well made and long lasting. Both of those features make NewWoodworker.com viewers feel better about spending their tool dollars on a product they can depend on for a long time. 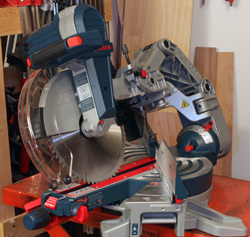 Click Here to see the full review of the Milwaukee 12" Dual-Bevel Sliding Compound Miter Saw! 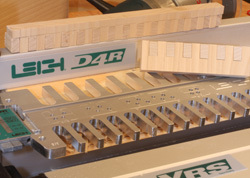 I finally got around to reviewing some of the attachments for the venerable Leigh D4 series of dovetail jigs in 2010. The response to the Leigh Multiple Mortise and Tenon Template was quick and enduring. I suspect that at least part of that interest comes from the huge numbers of woodworkers using the Leigh D4 and D4R jigs. The Leigh Multiple Mortise and Tenon Template adds a new dimension to the D4/D4R owners war chest of joinery skills. Judging by some of the photos I have been sent of work NewWoodworker.com viewers have done with the Leigh Multiple Mortise and Tenon Template that our woodworkers are making very good use of its capabilities. Click Here to see my full review of the Leigh Multiple Mortise and Tenon Template. Finding a Bosch jig saw in the NewWoodworker.com Top Ten Tools list should surprise no one. Bosch jig saws have been the virtually uncontested industry standard for years and there is nothing about the newest versions that indicate Bosch is even thinking about letting up on the rest of the industry. 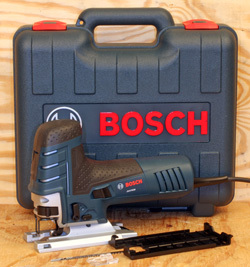 This new line of Bosch jig saws feature more power and a refined blade drive system. Some other controls have been tweaked to make them a bit more user friendly. All are good reasons for the NewWoodworker.com viewership to continue their approval of the Bosch line of jig saws. Click Here to see the full review of the Bosch JS470EB Barrel Grip Jig Saw. For as long as I can remember Bessey has been considered the best in clamping. The only thing that surprised me about the Bessey Edge Clamps was not finding them in the top half of the Top Ten Tools field. Perhaps that comes from the Bessey Edge Clamps being a bit more specialized in terms of woodworking clamping. The Bessey Edge Clamps serve a very specific purpose in woodworking but the NewWoodworker.com viewers liked them a lot and made that very clean in their large page view numbers as well as a large pulse of emails on these very useful clamps. 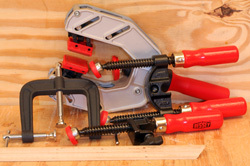 Click Here to see the full review of the Bessey Edge Clamps. I have to admit that I nearly passed on the Carter MAGFENCE™ review though now I can’t remember why. The NewWoodworker.com viewers showed me in no uncertain terms that they like the Carter MAGFENCE™ by visiting that page by the hundreds! If you have not seen the Carter MAGFENCE™ you need to check it out. Its ingenious design makes it compatible with virtually any machine with an iron or steel table. 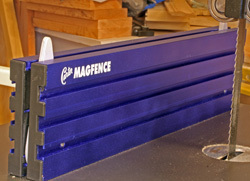 Apparently lots of NewWoodworker.com viewers have a suitable surface and a need for the Carter MAGFENCE™! Click Here to see my full review of the Carter MAGFENCE™. Leigh grabs a second presence in the NewWoodworker.com Top Ten Tools with their Leigh F3 Finger Joint Template. Finding a finger joint jig that makes useable finger joints has not been a fun task for woodworkers over the years. However, the large number of page views and emails relating directly to this template show that the NewWoodworker.com viewers apparently liked what they saw in the Leigh F3 Finger Joint Template Review! The email since this review supports my view that this is an easy to use template that actually makes great finger joints! Nobody was more surprised than I was when the Rockler Bench Cookie page view numbers started building immediately when I posted this review. What might have looked like a simple novelty was quickly accepted by woodworkers everywhere, including the NewWoodworker.com viewership. The Rockler Bench Cookies are another tool that gets better the longer you have them in the shop. I know I keep finding new things to use them for and I continue to get emails from viewers who are just as surprised – and happy that they got the Rockler Bench Cookies! Click Here to see my full review of the Rockler Bench Cookies. Despite this being a very task-specific tool the Kreg Beaded Face Frame Jig got lots of attention from the NewWoodworker.com viewers. Kregs reputation of building high-quality jigs certainly did not hurt the page view counts on this jig either. Much of the email I received on the Kreg Beaded Face Frame Jig touted its ease of use as a major reason they liked this review and the tool once they got it in their shop. Many viewers report being able to add this decorative touch to their projects and even tackle some projects they steered away from before the Kreg Beaded Face Frame Jig became available. Click Here to see my full review of the Kreg Beaded Face Frame Jig. Have a comment on this story? - Email Me!